Length: 18 1/2" R/S: 19"
During 1960, the United States Marine Corps (USMC) developed a need for a medium-lift tandem rotor assault helicopter that would replace the aging piston engine types being used at that time. 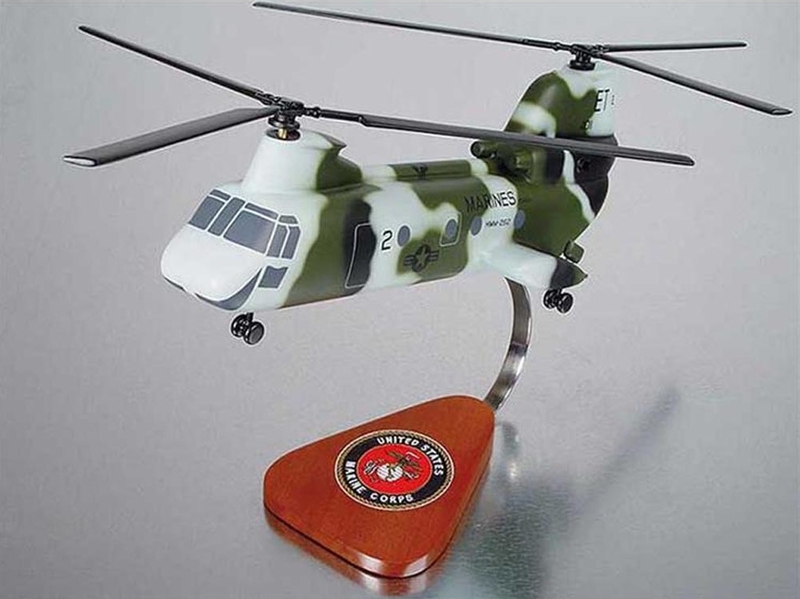 Boeing Vertol won the design competition and in 1961 the USMC picked up the CH-46 Sea Knight. Since its introduction, the helicopter has served with both the USMC and United States Navy (USN) faithfully. It has been used in all Marine combat and peacetime environments. Sometimes known as the “Phrog”, the Sea Knight is a descendant of Boeing's first turbine-powered helicopter, the Boeing 107. It is used by the USMC to provide all-weather, day-or-night, night vision goggle assault transport of combat troops, supplies and equipment into or within a battle area. Other tasks include combat support, search and rescue, support for forward refueling and rearming points, casualty evacuation and tactical recovery of aircraft and personnel. The unique tandem rotor design of the CH-46 helicopter allows for increased agility and superior handling qualities in strong relative winds from all directions. Because of this feature, tons of cargo and thousands of passengers have safely been transferred over the years. The Sea Knight can stay airborne for 2-3 hours. It has the ability to land and taxi in the water when needed, and stay afloat for up to two hours in light seas. While other helicopters are extremely limited in various flight maneuvers, the Sea Knight can fly rearward or sidewards.